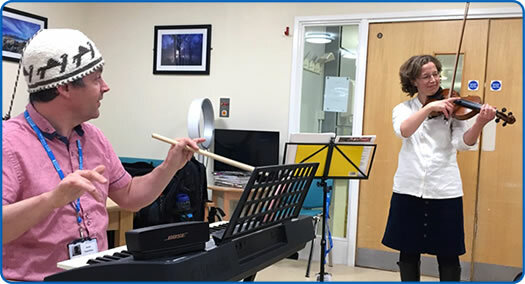 Play It Again is a music and storytelling project for older patients and patients living with dementia, staying in Ward 2 in Elgar House at Southmead. The project is designed with rehabilitation in mind. Songs and stories bring patients together, create a warm and friendly atmosphere and break up long, monotonous days. This means lower levels of stress and anxiety, boredom and loneliness, all of which contributes to improved wellbeing and emotional outlooks for our patients. Elgar House is a rehabilitation unit, operating as the next stage on from the acute care setting, to provide support and therapy to enable patients to return home or to prepare for nursing care. Many patients are frail elderly or living with cognitive impairments such as dementia and may be in the hospital for some time. Through Play It Again, weekly sessions bring Elgar House to life using music, storytelling, visual imagery and movement. Performance artist Colin Moody, from Alive! Charity, and violinist Ali Francis Black, encourage patients out of their beds and into the ward dining room for a sociable afternoon of chat and activity. “It helps patients come out of their shell and breaks up their day. Patients get excited to go as it’s something different. Brings back happy memories for patients. Good interaction for everyone. Patients get bored looking at the same four walls and they get excited and look forward to this” - Staff Nurse at Elgar House. The project takes place in the afternoon to help patients to stay awake and thereby support better rest at night. Play It Again combats the isolation, loneliness and boredom experienced by patients and supports their rehabilitation through emotional and psychological care. Interaction and time spent reminiscing allows patients to recover a sense of who they are and to engage with the wider world. For staff it offers a chance to relax with patients, to learn more about them and to connect with the whole person. Encouraging visitors and relatives to get involved also creates a lovely shared experience for them and brings back a sense of equality between them and the patient. Approximately 25% of older people in hospitals are living with dementia and, for these patients, being in the hospital environment can be particularly confusing and distressing. They require additional support to ensure they remain safe and their conditions do not deteriorate. In particular, they are more prone to malnutrition, dehydration and falls and their behaviour, when agitated, can sometimes offer real challenges to other patients and to staff. Play It Again uses music as metaphor and taps into patients’ knowledge of recognisable pieces, from well-known classical pieces like Pachelbel’s Canon, Beethoven or opera arias through to popular music from the 40s to 70s and well-known tunes from TV, film and musicals. Using familiar music gives patients a way to reconnect with memories, personal identity and their sense of belonging in the world. We also find that sharing the experience of listening to sad songs creates a way for people to articulate feelings which they might find difficult in words, and to release built-up emotion in a safe space. “Many have been inpatients for several weeks, or even months, and patients don’t get many visitors. Spending some time with our patients, engaging them in activities, really helps to stimulate them and lift their spirits. Your service gives them something to look forward to” Staff Nurse, Elgar House. The stimulation breaks up the day and helps patients to engage with each other and with staff and relatives. This all contributes positively to rehabilitation through positive, meaningful experiences and supports staff to deliver quality treatment and care. “All patients in beds were sitting up listening and no buzzers were ringing” – Physiotherapist following session. Really lifted the ward and the spirits of the patients who attended. Noticeable improvement in mood and motivation, patients who joined in stayed awake during music sessions. Something to look forward to. I have seen patients for the first time sitting away from their beds, smiling, reminiscing, interacting with others, stimulated and engaged e.g. singing along, clapping. You made a very grey day very, very good.